These hand-painted Barn Quilts are very rustic and will look awesome hanging outside on a house or garage or used as inside wall decor as well! Available in many patterns and colors, this particular pattern is Garden of Eden and is for the UNFRAMED 4' size, and comes in two halves. Pictured colors are Country Tan, Cinder, Ivy and Black. Please note that all of my quilts have a painted black border around the actual quilt pattern. It's my signature look. 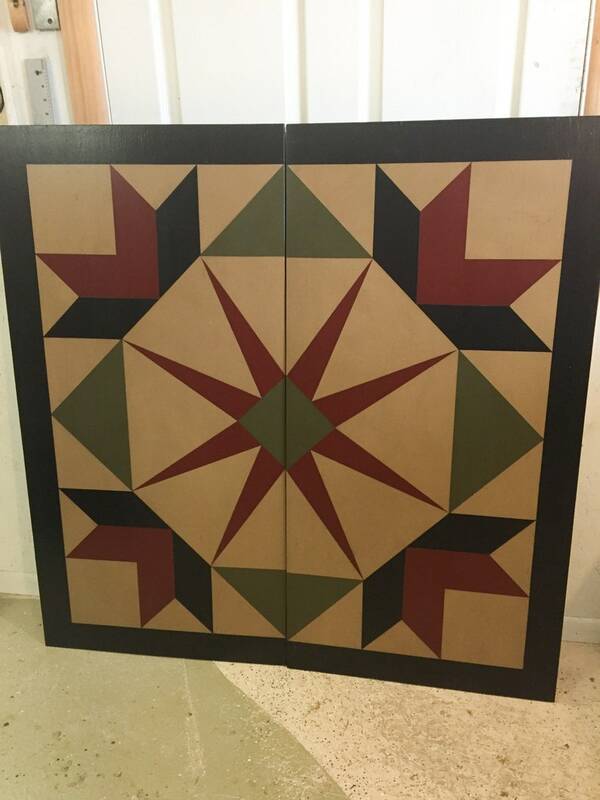 All of my 2 piece quilts are hand-painted on 1/2" plywood, using premium Exterior paints with primer, then are distressed and stained to achieve that aged look. They are finished with 2 coats of exterior Urethane. Thicker versions are available by special request, but for local pick-up only. PLEASE NOTE that normally all of my Barn Quilts are custom painted at the time of order, and may take 4-6 weeks for delivery.